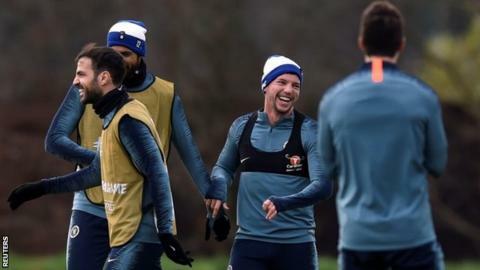 Chelsea manager Maurizio Sarri says there is no place for Danny Drinkwater in his team with his tactics – but he will not make a decision on the £35m midfielder’s future himself. The 28-year-old has only played once under Sarri, a 30-minute cameo against Manchester City in the Community Shield in August. Sarri plays a 4-3-3, in contrast to predecessor Antonio Conte’s 3-4-3. “I think for him the problem is only my football,” said Sarri. The England international made 22 appearances for the club last season following his move from Leicester City. Earlier this season, fellow midfielder Ruben Loftus-Cheek had trouble getting into Chelsea’s squad, with Sarri saying: “At the beginning of the season he was a very good player and now he is a good player that is more suited to my style of football. But the 22-year-old has now played in their last four Premier League matches since adjusting.